A complete tasty and balanced food for your four-legged friend. 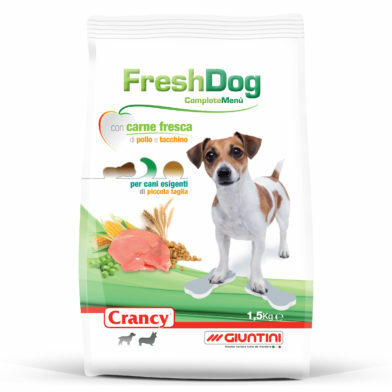 FreshDog Complete Menu has been developed by veterinary nutritionists to meet the needs of small breed dogs. Rich in fresh chicken and turkey meat with vitamins and minerals. This food is formulated for feeding dry, with plenty of fresh clean water provided separately. 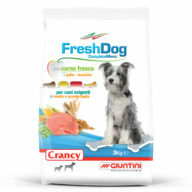 Crancy FreshDog Mini at will! Cereals, Meat and animal derivatives (fresh chicken and turkey 8% ribbon-shaped croquettes), Derivatives of vegetable origin, Oils and fats, Vegetables, Seeds, Vegetable protein extracts, Fish and fish derivatives, Minerals. Crude protein: 26%; Crude oils and fats: 13%; Crude fibres: 2,9%; Crude ash: 8,5%; Sodium: 0,3%. Vitamin A: 16.500 I.U./kg; Vitamin D3: 1.000 I.U./kg; Vitamin E: 120 mg/kg; E2 Iodine: 0,8 mg/kg; E6 Zinc: 19 mg/kg. FreshDog Complete Menu has been developed by veterinary nutritionists to meet the needs of medium and large breed dogs. 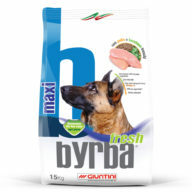 From Byrba experience was born Byrba Fresh Maxi: the evolution of an historic Giuntini’s product for large breed dogs.